The UE NEWS is the union's official print periodical, published four times a year. 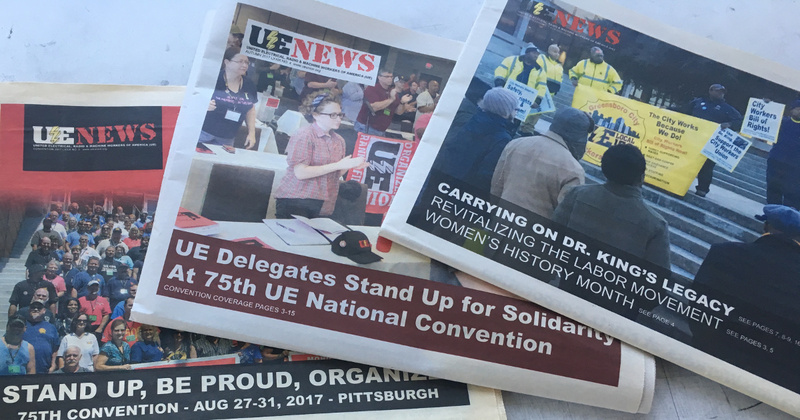 It carries news about contract negotiations, organizing, political action, leadership training, UE regional meetings and our national convention, and more. We also carry in-depth features on major current political and social issues affecting working people and on working-class history (including Black history and women's history), as well as reviews of books, music, movies and other cultural work. Most news stories from the UE NEWS are published online in UE NEWS Updates. Longer features can be found in UE NEWS Features, and coverage of political issues in Political Action Updates. The University of Pittsburgh Archives, where the UE Archives reside, has digitized every issue of the UE NEWS from 1939 to 2010. Additional online materials from the UE Archives can be found here.